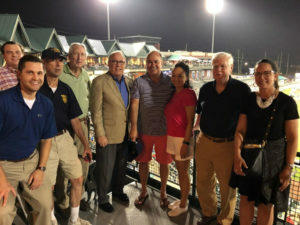 New Jersey Alumni and their guests attended the Somerset Patriots baseball game on August 17th at Bank Ball Park. Also, in attendance was SEAL Team Six Retired Captain, Ron Yeaw, who threw out the ceremonial first pitch. Captain(RET)Ron Yeaw earned 45 medals and ribbons including the Superior Service Medal and Navy Legion of Merit; five Defense and Navy Meritorious Service medals; and a Purple Heart. 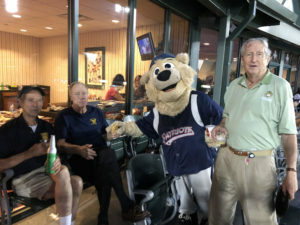 The New Jersey Chapter enjoyed the company of CAPT Yeaw and the game from a private suite. The Naval Academy NJ Chapter was honored by the game announcer during the 7th inning.